Grassfed Geek: Announcing the Grassfed Geek Podcast! Announcing the Grassfed Geek Podcast! I'm excited to announce that I'm starting a podcast based around my blog concept. It's called (you guessed it), the Grassfed Geek Podcast! Basically, I realized that there were certain things I wanted to talk about that I felt would be better if released in an audio format. I'm still working on the technical side of things, and as I don't have much background in studio recording there may be some issues to work out. Please let me know if you feel the podcast has some glaring issues that, if fixed, would improve your enjoyment of it. This will be a really fun experiment, and I hope you all like it! 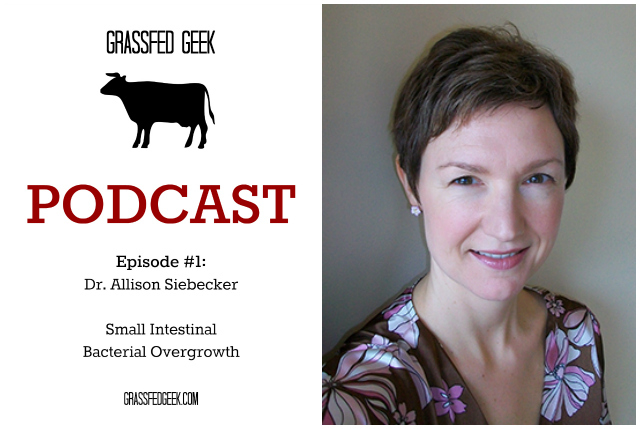 For this first episode I talked to Dr. Allison Siebecker. She's a naturopathic doctor here in Portland, OR who specializes in gut health, and specifically SIBO (Small Intestinal Bacterial Overgrowth). We had an awesome conversation a few weeks ago about the human microbiome, the gut issues we all may face in our lifetimes, and the positive impacts of eating a more whole foods, Paleo-type diet. You can find her through the National College of Natural Medicine Clinic website for more information about her as well as contact info if you are having some kind of digestive issue and would like her help! She also has a great website dedicated to SIBO that has a ton of info about what SIBO is, what symptoms are associated with it, and what treatment options are available (SIBOInfo.com). There are SO many symptoms that are potentially caused by SIBO and it's more common than you may think; anyone with a persistent digestive issue will want to check it out. We're finding out more and more every day about how the health of our gut determines the health of our entire body and mind, so I'm so excited to share my conversation with Dr. Siebecker with you and I hope you dig it! Thank you for this! My husband and I are working to consume 100% grassfed meat and also become at least 80/20 with a Paleo diet. Right now, we are about 60/40 eek. We will get there, though and this blog will help to keep us motivated to put our grocery money to better use. It's delicious because it's good for you.